For writers who aspire to be published authors, the structure of online MFA programs can be exactly what they need to finish their manuscript and open doors to a writing career. A writer’s struggle, however, isn’t always in generating creative ideas or artistic ambition, but with tapping into the momentum to finish a project while managing a busy life. 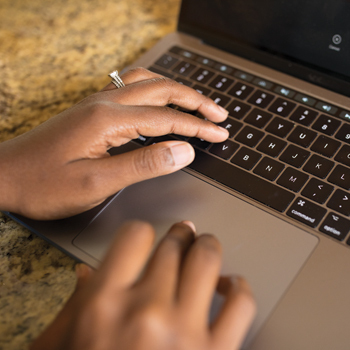 National University’s online MFA Creative Writing program was the first in the nation to offer a completely online MFA with no residency requirements, recognizing that many aspiring writers have the inspiration, if not the time and resources, to bring their work to its full potential. “The typical student is someone who has been writing for years, really enjoys it, and recognizes this inner potential. They might have a career in another field, but they want a plan to take their writing to the next level. That’s the story I often hear from new students in our MFA program,” says Frank Montesonti, Academic Program Director of National University’s Master of Fine Arts in Creative Writing program. The program, he emphasizes, is designed specifically for working adults who want to complete and publish their novel, poetry, script, or creative nonfiction work. Start the Next Chapter of your Life, From Home. Writers with a goal of finishing a publishable manuscript, stresses Montesonti, often don’t have the time or money to participate in the residencies that many online MFA programs in creative writing require. National University’s online MFA in Creative Writing provides the full benefits of a writing career incubator without asking students to take time away from their jobs and families to travel to a campus residency. “There are a lot of low-residency master’s in fine arts programs which force you to travel somewhere for two weeks or a month, and lots of people can’t do that with kids, jobs, or active military duty. It can be unrealistic economically, or for many reasons,” explains Montesonti. National University has been consistently ranked as one of the best universities to earn an online master’s in creative writing. In 2005, it was the first to recognize that working adults with the motivation to become published writers didn’t need to spend thousands of dollars each year on residencies like many online MFA programs. In addition to this cost savings, National University’s online MFA curriculum offers accelerated courses that students complete in one to two months. In addition to the core curriculum, students choose from elective courses including multicultural literature, historical literary periods, film theory, or critical study of a single renowned author, from Jane Austen to Gabriel García Márquez. MFA students take one course or workshop at a time, allowing them to focus, to build creative relationships with their peers and faculty, and to fit achievable writing goals into their busy lives. Writers can enter the program at any point and it’s possible to finish your MFA online — and thesis work of a completed manuscript or feature-length script — in less than two years. “Students tell me they feel want to improve in the craft of writing,” says Montesonti. “Our goal is to help you not just produce that first manuscript, but to take it to the next level.” To transform their craft and become stronger writers, creative writing students need perspective to shift their mindset about writing, a supportive and experienced community, and program content that challenges them to become professional writers. Writing is, without question, a time-intensive craft, and online MFA programs should equip students with the skills they need to get words on the page every day. It also requires inner resources such as mental discipline, structured creativity, and training to maintain momentum. Finishing that first draft can feel like a daunting task. Revising a story and enduring the rewrite process takes practice and encouragement — an experience the National University MFA faculty members understand as published authors, screenwriters, and poets themselves. “It’s frustrating when you don’t know who to talk to about your writing,” Montesonti says. “It’s hard to know if you’re doing the right thing and not wasting your time.” He relates to the online MFA students he teaches and mentors who enter the program with a great story or script in mind and want guidance that will make a perceptible difference in their writing. Faculty members who teach in National University’s master’s in literature and MFA programs are published, produced, and active writers who both encourage their students to grow as writers and can have frank discussions about how to leverage an MFA education. Students personally choose their thesis advisor from the dozens of experienced faculty members, and this person provides close mentorship while you finish your manuscript, Montesonti explains. Getting your master’s in creative writing can be an empowering step toward becoming a professional writer or teaching creative writing to others. Prospective students can think of their MFA as a home you plan to live in—and write in—in order to complete your thesis. It’s important to know the layout, how it’s furnished, and whether the décor suits your style. Become familiar with the layout: what are the learning outcomes, requirements, and coursework for the program? In terms of “furnishings,” does it offer close mentorship by experienced, published writers? To know whether your personal writing “style” is a match for the MFA program, ask the admissions advisors which faculty specialize in your area of interest and can give you specific career advice. For the sake of master’s thesis work, online MFA creative writing students at National University ultimately focus on one genre, but they’re not expected to decide before they test the waters. Unlike some online MFA programs in creative writing, genre-switching is not only encouraged, it’s required. Students complete five core classes, three of which are explorations of fiction, poetry, creative nonfiction, or screenwriting. Advanced workshops and specialized electives allow students to take a deeper dive into their thesis preparation. For someone who has been in another career field most of their life, wondering, “Can I do this?” Montesonti feels strongly that the evidence speaks for itself: absolutely. “History is full of stories about writers who had different careers and didn’t write their first books until later in life – and who were wonderfully successful,” he quips. One of the most productive things writers can do when considering an MFA writing program is to denounce the myth of the writer emerging fully-talented, without practice, from their youth. Life experience, he points out, provides us with stories. “We have students from all walks of life, experience, and backgrounds: nurses with twenty years of experience, retired doctors and teachers. I’ve had students who were soldiers, writing poems on the ground in Afghanistan for their poetry workshop,” he says. While students entering the National University online MFA creative writing program typically have an idea of which types of stories they want to write, the top concern Montesonti hears is: Am I going to fit in? That “at-home” feeling is important for an MFA experience where students participate in a “writers’ studio” style learning environment — sharing weekly writing projects for critique and praise from writers on similar journeys, and from experienced faculty members. National University’s online MFA program builds a community of support around each student in several ways. Students take one course at a time — two months for a workshop or one month for an elective course — and every week the students submit their writing, whether that’s a short story, a poem, or a chapter or scene from a longer piece of work. Professors and students discuss each submission, giving MFA students the chance to know what’s working and where they can strengthen their skills. This sounding board environment is how MFA students absorb readers’ reactions, praise, and constructive advice for improvement. According to National University surveys, more than a quarter of their graduates report they found publication for their master’s thesis project, from published novels to literary journals. For many alumni of the MFA in Creative Writing program, their thesis work was just the beginning of a career as a professional writer. 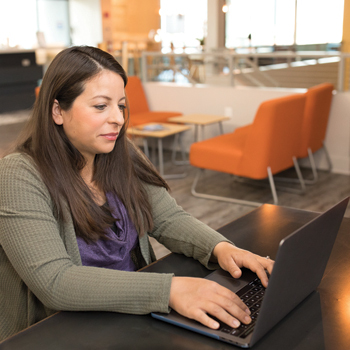 With more than 1,000 graduates from across the country and around the world, National University’s online MFA program alumni community is a vibrant and diverse network that benefits students for years after graduation. National University holds MFA in Creative Writing alumni workshops and events for students and alumni to network and exchange knowledge. The diversity of experience is what makes National University’s online MFA creative writing program work as a global community — and what leads to compelling writing. Asynchronous learning — meaning, students complete coursework on their own schedules — makes it possible for MFA students to complete the program from anywhere. Some of their MFA students living with disabilities, Montesonti explains, only would consider a completely online format. About twenty percent of National University’s creative writing students are active military who need the flexibility and accelerated coursework the program offers. National University was founded by retired U.S. Navy Captain David Chigos. As a Yellow Ribbon school, the university accepts the post 9/11 GI Bill®, making the online MFA program a welcoming choice for veteran and active-duty students and their families. “We’ve worked with the largest number of active duty military students of any MFA program around,” comments Montesonti. “There’s such a broad range of compelling stories to tap into.” From more accurate and positive portrayals of soldiers with PTSD to fiction that gets at the heart and vulnerability of extreme situations, these MFA students find storytelling a powerful tool. This practice, often outside the normal comfort zone, helps a writer explore new possibilities for their poetry, screenwriting, or fiction writing craft. Screenwriting for fiction writers, for example, can help a published author understand how their book might be adapted for the screen. All of the faculty members who teach screenwriting in the online MFA creative writing program live and work in Los Angeles and are actively involved in the film and television industry, says Montesonti. MFA students who want to focus on or explore screenwriting benefit from this close affiliation and direct experience. “It’s very LA-centered. If you want to study screenwriting in depth, our faculty are produced, professional screenwriters.” As an elective, MFA students passionate about film narrative can take a course focusing on a filmmaker who has inspired them. Many students, Montesonti shares, are surprised to learn that the writing faculty doesn’t look down on a student’s aspirations to become a bestselling author or genre fiction writer. The program places high esteem on well-written fiction, including horror, sci-fi, fantasy, and romance, as MFA thesis projects. Writers interested in genre writing and young adult fiction will find several faculty members who specialize in these areas. One of the opportunities master’s in creative writing students have at National University is to work as a student editor of The GNU, the university’s online literary journal. GNU is a student-run literary publication that accepts submissions from all over the country. The process of editing a literary journal and vetting submissions from writers and MFA alumni helps students understand what editors are looking for, and the range of work that a typical literary journal receives. Adding value to the MFA experience, Montesonti and other experienced faculty members strongly encourage their students to complete electives in writing pedagogy. Earning your MFA qualifies writers to teach creative writing at the college level, and about 36% of National University MFA alumni pursue higher education teaching opportunities. Courses in Writing and Composition Pedagogy help prepare writers to teach others along the way. The MFA in Creative Writing at National University is a 100% online MFA program designed for writers, by writers, with no residency requirement, which means more time for writers to build their skills, finish their novel or script, and build a network of like-minded writers. Regardless of your current career, or the location of your writing station, the program is designed for people with busy lives who want to complete and publish their novel, poetry, script, or creative nonfiction work. With no GRE requirements and monthly entry dates, aspiring authors can set their plans in motion right now, backed by the support of an entire MFA program of motivated writers, successful, published authors, and a vast alumni network. For more information, be sure to visit our website.